After 3 years of development we are proud to announce the release of our new near field model S651a that is our first active speaker model. 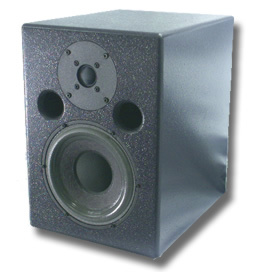 Although it is a active speaker the design is fully analogue, even with a passive crossover design. The signal path is not altered what so ever, we don't even have a gain trim. Most active speaker design today fall for the temptation to put in a lot of signalling adjustment, like EQ, and in worst case even tries to compensate for the transducers and design shortcomings. We don't. We select the transducers and matching design in order to be as close to perfect as possible so that no compensating for design or transducers shortcomings is needed. This is off course a time consuming design phase and puts high requirements on the transducers. 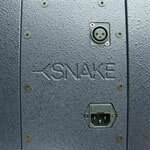 In fact we have been monitoring the amplifier module evolution for more than 10 years but it was not until 2003 that we thought the technology had reached our demands for a active Snakespeakers. The amplifier dimensioning is to our standard headroom matching, in this case 290W, witch is far more than other active speaker on the market in this size of near field cabinet. The design spec for the S651a was to offers the ultimate accuracy for studio near field monitoring. Low distortion, , linear accuracy at all power levels, wide bandwidth and high peak SPL capabilities for the most demanding dynamic material. XLR 10k ohm balanced with RF filter. 6,5 " Long throw +-6mm, low distortion. 1" Coated fabric dome, vented voice coil and immersed in magnetic fluid. Passive 2,2kHz asymmetrical, complex load adapted. 114 dB @ 1m per pair with music material. As in all Snake Speakers, the components used in S651a are individually tested before assembly, crossover components, speaker drivers as well as the cabinet. On top of this an extensive final test is performed. The whole production chain from crossover assembly, wooden cabinet to final assembly and test are performed by some of the most experienced people in the industry. ICEpower® What is it, how does it work?